I don’t know how or where to begin. The other day was just a normal day. Except that Emmalee, our older girl-collie dog, had thrown up a pile of some disgusting ex-food and I had to clean it up. Which, for me, takes a good deal of time and planning as I cannot get down to the floor easily, or even hardly! I did that and let her out. She would not eat her supper. She had not eaten her breakfast, either, that day. Hmmm… there is a disturbing pattern here. Kip has been eating as usual. I called the vet. They were super busy and put me on hold – for a half-hour! Finally, I told them the scoop and they would see her that afternoon at 5:40 p.m.
Once Paul got home from work, I got a sample each of her poop & pee and we bagged those up for him to take with him. Better to be safe than sorry. At about 6:30 they got home. He said she has a bowel problem and is to take antibiotics for a week and go on a bland diet of cooked chicken, boiled rice, and cottage cheese. The next day I got out a big package of boneless skinless chicken thighs and cooked them all in a baking dish, ready to be cut up for meals for her. I made a batch of rice (Oh, I need to make more! – note to self! )… and we have the cottage cheese here anyway. She had blood drawn for the usual panel of bloodwork. The following day the vet called. I listened as he went on and on about how ill Emmalee is, or may be. Her levels were all over the map. Very high liver enzyme levels.. and other stuff… it’s all a big blur to me now, my brain is so stuffed with what’s good and what’s not good anymore. He wanted to speak with Paul, so once Paul got home he called and finally the vet called him back. He talked to him for quite a while — well, he listened to him… and hung up. He told him all he told me. He wanted Em to have an ultrasound of her abdomen ($350.) asap, or he wanted her to go on supplemental meds – which we chose to do ($150 for 2 items). ($275 for the office visit!). As you can see, this is not a wallet-healthy endeavor. 4:30 a.m. Paul has to get up and give Em 2 giant capsules of Denamarin on her empty stomach and then WAIT 1 HOUR before he can give her her breakfast. 5:30 a.m. Breakfast for Em of chicken/rice/cottage cheese PLUS one of the antibiotic pills (metronidazole) with each meal), plus Kip has his usual breakfast then which is, of course, different. Both dogs out and in as usual. He is off to work. 1:00 p.m. I have to give Em her second meal of all the same thing except for the big clunker capsules, those are only once a day, but she has to have another meal of the chicken/rice/cott.cheese. All the while trying to appease Kip because he’s getting nothing! I give him a milk bone biscuit, which I’ve been giving them each day forEVER. See here for what I’ve learned… out go the boxes of Milk Bones! Expose: What’s in those Treats? At 4 p.m. Kip wants supper. Of course, so does Em but she can’t have it then. She has to wait til 8:30 or 9 for hers. Kip eats his and Em sulks. Not good. Not fun. I have to say my heart is not into cooking supper for us. I made the worst supper EVER last night… it was gross, overcooked hamburg patty and a weird coleslaw… I had to apologize to Paul for it… disgraceful. My brain is just not functioning properly. at 8:30 or 9 p.m. Em has to have her last meal which is the trio/combo PLUS the antibiotic pill PLUS the other Supplement that is a powder and is for liver problems. This is mixed in with her food. Now this should be given 3 times a day but not at first, only once a day for 5 days for now and then increase it! She gobbles all this up quite well and I’m glad she likes it. Freshly cooked chicken, what dog wouldn’t? I think we both tossed and turned all night. So the plan is to give her the supplements for a bit and see if any levels go down. Then if necessary, (which is what the VET wants, of course), get the scan of her innerds. Then I don’t know what is next. THIS YEAR HAS TOTALLY SUCKED! Sorry, to be so blunt, but it has! I know some of you have lost your beloved pets during this recent time period, too, and my heart just breaks and aches for you in that regard. We don’t want to lose Em… she’s 9 now and it just seems that no matter what I choose to feed them, it’s wrong! I changed the brand of kibble today with my provider, Chewy Dot Com. The stuff I bought I’m just not sure about now (Core Wellness Chicken Kibble) – maybe Em has a chicken allergy? 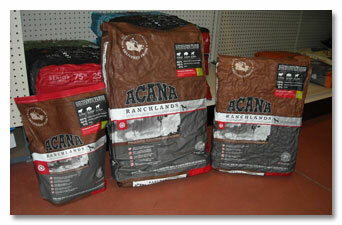 Anyway, I’ve changed to “Acana Ranchlands Regional Formula Grain-Free Dry Dog Food” which was rated the best by someone or other! It’s also very expensive… more than $30 more per month than my old brand, and even THAT was high! If it helps my dogs then it’s worth it. It’s just all so complicated and disheartening when the things they advertise as being so good for your pets really are toxic to them! Just read that link I provided above about the milk bones! If it’s not one thing around here it’s another. 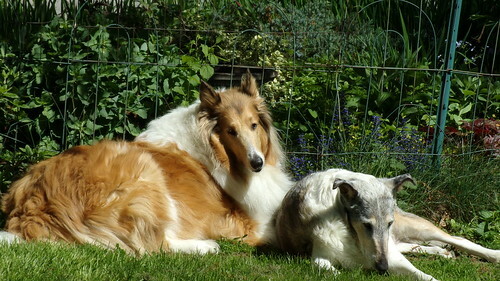 13 Responses to Dog Daze, or What to Feed the Dog? It’s been a tough year for you, for sure. I hope the food and medicine help Em. If she hasn’t been sick to her stomach since you started the bland diet and meds, that’s good news. I totally agree with Bobbie. The cost for vet care is so high. And they do push you to tests that are often not only expensive but inconclusive. That’s all terrible news. I know in the past there have been times when I’ve spent a lot on vets. What can you do when you’ve got an animal depending on you? But I really have to wonder about the charges. I think maybe Bobbie has a point. It puts us in a tough spot. We want to do the right thing for our pets but is doing everything you’d do for a human really the right thing for a dog or a cat? Us humans sometimes opt to heal ourselves if possible before resorting to everything a doctor suggests. I sure hope Em is okay and I would think at her age she will be. I agree with it all, Bobbie! So much to think about. Food. I will give the idea of changing my dog and cat food. Hope Em bounces back quickly. You are so right Maggie. I just told Paul that all pet foods from the supermarket are poison! So no more buying on the cheap for them! I should have learned this lesson many many years ago… but I get lazy. Just had a look at the article Bex, and would like to add that almost ALL food in the grocery store (people food) had sulphites in it, or is processed in an environment where it is exposed to sulphites in a significant way. Even some organic foods are preserved with it. People have been eating great quantities of it since the 1980s. Check the labels, you will be amazed. Try and find foods without it, it is hard work. So sorry to hear of Em’s health woes Bex. The “cure” does sound very complicated, I hope it is helping! Remember to take good care of yourself through this ordeal. Sending healing thoughts to your house!